The SI Carbine Flat Wire Spring is an economical and easy upgrade to any AR system with a carbine buffer system. 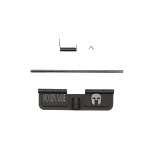 The flatwire spring increases service life of the platform, smooths out the shooting cycle, and greatly outlasts the stock spring. Increased bolt load, in addition to decreased compression force increases reliability in cycling. Additionally, all SI Flat Wire springs are cryogenically stress relieved to provide greater consistency, longer spring life, and greater resilience to high cyclic rates. At a cost not much greater than stock carbine springs, the SI Flatwire is an easy option for those either looking to replace worn buffer springs or begin new builds. - Gauge (Flat Wire Profile): 0.045" x 0.0935"
- Decreased harmonics lessens system vibration for faster follow up shots. - Reduces distracting AR "twang"